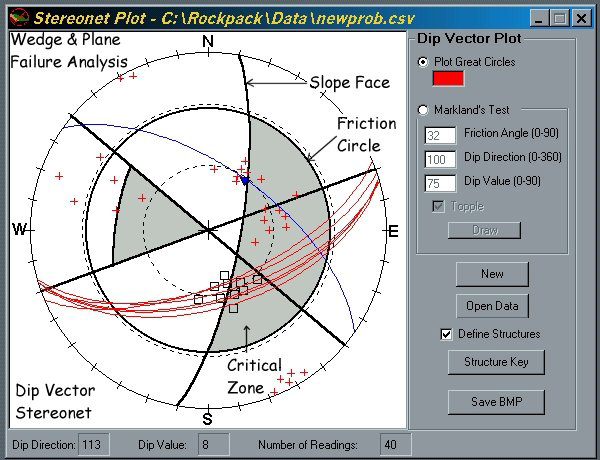 RockPack III is a package of programs useful for all phases of rock slope analysis and design where stability is controlled by the orientations and characteristics of rock mass discontinuities (joints, bedding, foliations, faults, etc). RockPack III is applicable to practically all rock excavations, including highway roadcuts, quarries, mines, and building excavations. 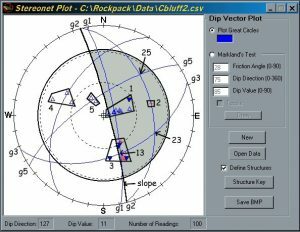 RockPack III is designed to support the user from data collection through geologic analysis by stereonets to safety factor calculations by limit equilibrium methods and finally to slope design and design of artificial support if required. 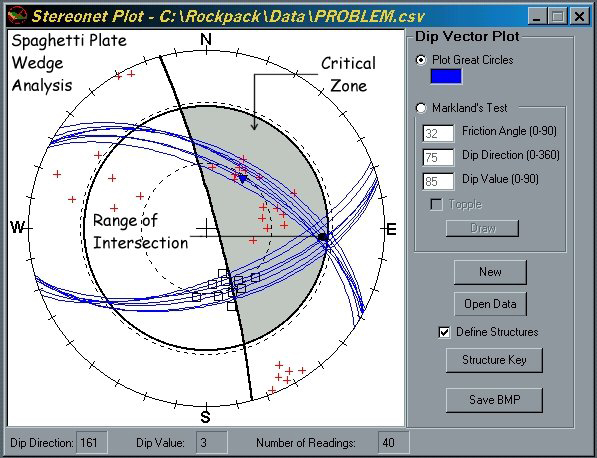 Capabilities include computerized field data collection, stereonet analyses to identify possible failure types, safety factor calculations for potential failures, and design of rockbolt or cable support, to mention only a few. 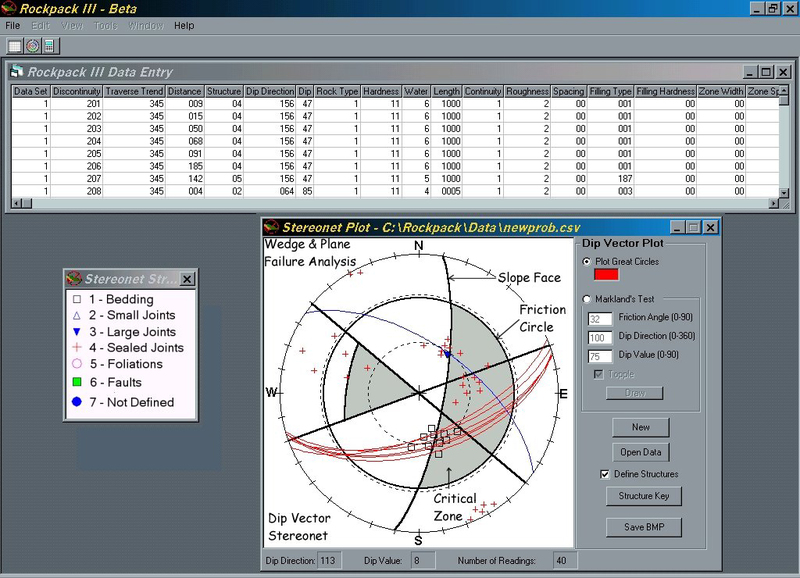 Will the program handle complex excavation geometries? The programs making up the RockPack III package are based on the text "Rock Slope Engineering" (Hoek and Bray) with enhancements and modified approaches developed over the past 10 years in cooperation with the Corps of Engineers, the US Forest Service, and numerous state DOT's. It's not obvious to the user but RockPack is actually a bundle of 18 programs linked together by a master menu. The analytical approach that we take is to break excavations into distinct domains based on both geologic conditions and excavation geometry. 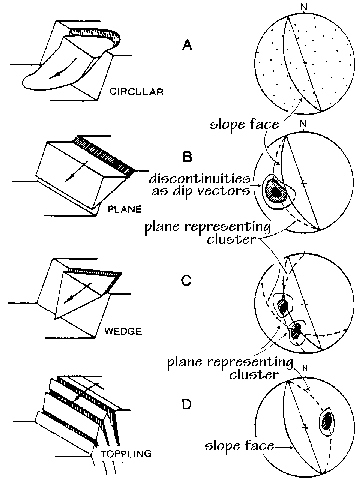 The more complex an excavation, the more individual stereonets we examine in order to identify potential instabilities. 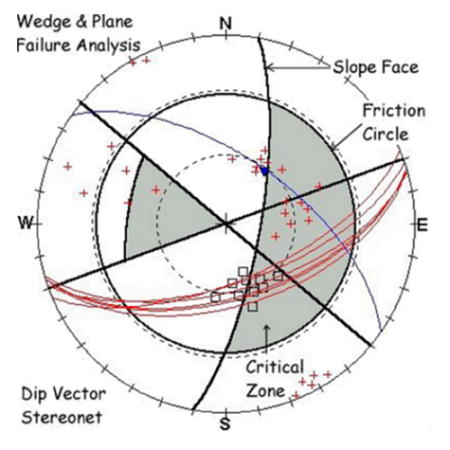 The stereonet portion of the programs work great for identifying potential plane, wedge, and toppling failures utilizing Markland's test and variations of Markland's Test. 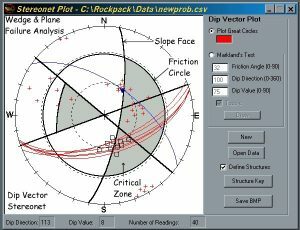 After identifying potential instabilities, RockPack is capable of calculating safety factors for potential plane, wedge, and toppling failures based on approximations of geometry's as in Hoek and Bray. How many joint sets will the program handle? I believe the latest version will handle 800 but I try to discourage people from going over 100. Using large numbers of discontinuities implies to me that people are trying to include joints from the entire site which tends to blur the more important picture of what is happening within a specific domain. Discontinuity orientations and characteristics can change dramatically from one end of a site to the other end... and only discontinuities those within a particular area will control stability in that area. Does the program differentiate between tensioned and untensioned support? The program allows you to enter bolt orientations and bolt tensions when calculating effects of artificial support. Untensioned bolts (dowels) would have to be taken into account by increasing the rock mass cohesion values to compensate for the bolt shear strength. If that's something you want to consider... I can help you estimate the values. How does the program handle water pressures? Tension cracks? Water pressures can either be calculated from the geometry for worst case conditions, or estimated conditions may be entered, or values from piezometers may be entered directly. 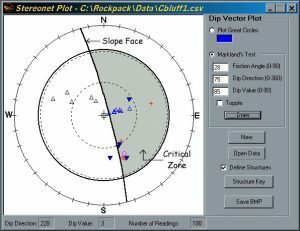 Since this is rock, the programs assume secondary porosity along the discontinuities controls by producing uplift and driving forces within the discontinuities. See the diagrams in Hoek and Bray's text. 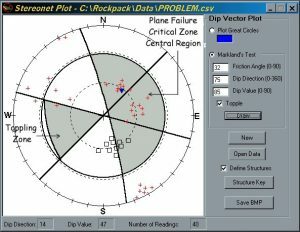 Can the program handle seismic loading? Yes. 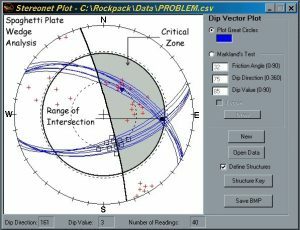 Seismic loading is entered in terms of acceleration in g's and assumes the worst case direction for the seismic forces. The current version of RockPackIII has a known error in the PLANE failure calculations when metric units are used. You can download a patch that provides a special program with a fix by clicking on the link below. If you have purchased a license and are ready to activate it, you'll need to right-click on the program shortcut and choose Run As Administrator. Enter the registration number you were issued into the Serial Number prompt and click OK. The program should record the license information and start. Future launching of the program should not require the Run As Administrator elevation.